Pizza Capers - Spring Hill uses their own specialised couriers to deliver their food. Oven-roasted chicken, capsicum, garlic and corn on a smokey BBQ and paprika spiced classic Detroit square thick base. Topped with mozzarella and our classic pizza sauce. Fresh mushrooms, smoke cured pepperoni, ground beef and garlic on a paprika spiced classic Detroit square thick base. Topped with mozzarella, mixed herbs and our classic pizza sauce. Our famous smoke cured pepperoni on a paprika spiced classic Detroit square thick base. Topped with mozzarella, mixed herbs and our classic pizza sauce. Generous amounts of mozzarella cheese on a paprika spiced classic Detroit square thick base. Finished with mixed herbs and our classic pizza sauce. Butterflied prawns, chorizo, capsicum, onion and mozzarella on a classic pizza sauce base. Topped with saffron aioli, fresh herbs and lemon wedges. Finished with salt and pepper paprika. Loaded with premium seasoned beef slices, ground beef, chorizo, bacon, capsicum, corn and mozzarella on a smokey BBQ sauce base. Topped with aioli and fresh herbs. Olive oil, a little tomato pasta sauce, fresh shallots, cherry tomatoes, garlic, herbs and prawns with house cooked linguine. Finished with fresh herbs, parmesan & a lemon wedge. Classic tomato pasta sauce with fresh diced tomato, onion, garlic, chilli flakes and bacon with house cooked linguine. Finished with fresh herbs & parmesan. Mozzarella, bocconcini, parmesan, a hint of blue cheese, thickened cream and fresh shallots with house cooked linguine. Finished with fresh shallots. Luscious satay marinated tofu, shallots, onion, red capsicum & vegan cheese on a light olive oil base. Finished with satay sauce, cucumber & carrot slaw & cashews. Tender chicken slices, bourbon BBQ sauce, fresh mushrooms, Spanish onion, blue cheese, rasher bacon and mozzarella, topped with bourbon BBQ chicken wings, aioli, fresh shallots and parmesan. Oven-cooked chicken slices, sliced avocado, Spanish onion, crushed garlic, cracked pepper and mozzarella on a pizza sauce base, finished with fresh rocket, hollandaise and Parmesan cheese. Cajun chicken slices, fresh mushrooms, sliced potato, sweet chilli sauce, pizza sauce and mozzarella, garnished with shallots and a drizzling of sour cream and chives. Piri Piri sauce, tender chicken slices, Spanish onion, crushed garlic, red capsicum, cherry tomatoes, mozzarella and African spice, finished with aioli, shallots, cashews and a zesty lemon wedge. Oven-roasted chicken, pesto pizza sauce, rasher bacon, button mushrooms, red onion, crushed garlic, Roma tomatoes and mozzarella, garnished with pesto aioli, parmesan and fresh herbs. Japanese crumbed karaage chicken, avocado, onion, diced tomato and mozzarella on a sweet soy sauce base. Garnished with shallots and finished with kewpie mayo, sweet soy sauce and a lemon wedge. Fresh mushrooms, sliced pepperoni, leg ham, mixed herbs, garlic and pizza sauce, topped with mozzarella, creamy camembert and fresh parsley. Classic pepperoni, premium beef, sliced leg ham, crispy bacon and mozzarella on a smokey BBQ sauce base, garnished with fresh herbs. Paprika roasted potato slices, mushrooms, fresh red onion, bacon rashers, mozzarella and creamy pizza sauce, topped with shallots and a drizzling of sour cream and chives. Italian pepperoni, Kalamata olives, Roma tomatoes, red capsicum, Spanish onion, classic herb mix, crushed garlic, fresh basil, mozzarella and pizza sauce, finished with rocket, balsamic glaze, parmesan and chopped parsley. Aussie roast lamb infused with garlic and sweet rosemary, layered with roast potato, mushrooms, red onion, cherry tomatoes and camembert on a rich pizza sauce base, then topped with mozzarella and fresh herbs. Byron Bay Chilli Co's. red bean salsa, sliced chorizo, premium beef, jalapeños, garlic, onion, red peppers and mozzarella. Topped with shallots, sour cream and chives. Served with a bonus side of crunchy corn chips and guacamole dip! Pesto pizza sauce, tender lamb, chorizo sausage, roasted Roma tomatoes, onion, Kalamata olives, crumbled feta, garlic and mozzarella, finished with rocket and a juicy lemon wedge. Mild pepperoni, sliced leg ham, fresh mushrooms, red onion, roasted capsicum, kalamata olives, crushed garlic, mixed herbs, pizza sauce and mozzarella, finished with a sprinkling of parmesan and parsley. Succulent pulled pork, crispy rashers of bacon, smoke cured pepperoni, onion, garlic and mozzarella on a smokey BBQ sauce base, topped with a sprinkle of fresh parsley. 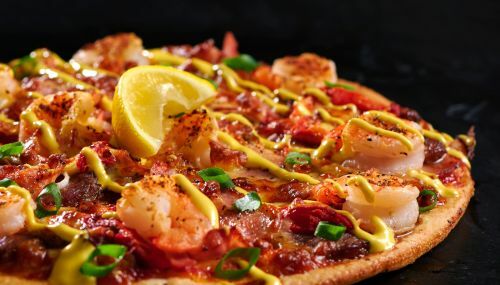 Premium beef, Cajun prawns, rasher bacon, Spanish onion, capsicum, lemon pepper, mozzarella on a pizza sauce base, finished with hollandaise, fresh shallots and a lemon wedge. Mussels, scallops, barramundi, juicy prawns, lemon pepper, Cajun spice, Spanish onion, plump cherry tomatoes and mozzarella on a sesame oil base, garnished with balsamic glaze, aioli, fresh herbs and a zesty lemon wedge. Handfuls of butterflied prawns, roasted peppers, sweet chilli sauce, lemon pepper, pizza sauce and mozzarella, topped with fresh shallots and a zesty lemon wedge. Napoli sauce, fresh basil leaves, sliced eggplant, arancini balls, cherry tomatoes, artichoke hearts, mixed herbs, crushed garlic and mozzarella, garnished with creamy aioli and fresh herbs. Roasted eggplant, Kalamata olives, crumbled feta, artichoke hearts, roasted Roma tomatoes, crushed garlic, mixed herbs, fresh shallots, classic pizza sauce and mozzarella, finished with rocket, balsamic glaze and freshly chopped parsley. Sweet potato, button mushrooms, crushed garlic, pizza sauce and vegan cheese. Garnished with rosemary and salt flakes. Finished with sweet chilli sauce. Tender chicken, button mushrooms, smokey BBQ sauce, Spanish onion, crushed garlic and mozzarella. Finished with chopped parsley. Premium ham, fresh mushrooms, olives, crushed garlic, mixed herbs and mozzarella on a pizza sauce base. Finished with a sprinkling of fresh herbs. Sweet Roma tomatoes, freshly picked basil, bocconcini, traditional pizza sauce, crushed garlic, classic herb mix and mozzarella, finished with fresh herbs and parmesan. Our famous smoked pepperoni, Spanish onion, pizza sauce and mozzarella, garnished with fresh parsley. Sliced leg ham, pineapple, rasher bacon, pizza sauce and stretchy mozzarella. Fresh button mushrooms, Spanish onions, roasted capsicum, kalamata olives, pineapple, signature pizza sauce, medley of herbs, crushed garlic and mozzarella. Finished with fresh parsley and parmesan. Four oven-baked jumbo wings! Light crispy crumb on the outside, tender juicy chicken on the inside with subtle heat that builds. Comes with Ranch Dipping Sauce to help control that Southern fire! Six juicy oven-roasted wings, coated with bourbon BBQ sauce. Finished with parmesan and shallots. Six super hot and spicy Sriracha chicken wings, finished with coriander and a lemon wedge. Six juicy wings marinated in our mouth-watering piri piri sauce, then oven-roasted and served with a fresh lemon wedge. Creamy mushroom and white wine sauce, fresh shallots, rasher bacon and linguini, finished with fresh herbs and Parmesan. Linguini and beef bolognese sauce, finished with Parmesan and fresh herbs. Barramundi, butterflied prawns, scallops, linguini, Napoli sauce, fresh shallots, lemon pepper with fresh herbs and Parmesan to finish. Tender chicken slices, basil pesto, Roma tomatoes, Spanish onion, garlic and linguini in a creamy white wine sauce, garnished with cashews, Parmesan and fresh parsley. Mozzarella and classic pizza sauce. Tender chicken slices and mozzarella on a pizza sauce base. Leg ham, mozzarella and pizza sauce. Juicy pineapple, sliced leg ham, mozzarella and pizza sauce. Hot Pizza Bread topped with Vegemite and Mozzarella. Creamy blue cheese, garlic and stretchy mozzarella. Vegan cheese and crushed garlic. Basil pesto, crumbled feta, crushed garlic and mozzarella. Mozzarella and sweet chilli sauce. Vegan cheese and sweet chilli sauce. Fresh rosemary, garlic, mozzarella and salt flakes. Fresh rosemary, garlic, vegan cheese and salt flakes. Hot Pizza Bread topped with Vegemite and Mozzarella. Served with a side of Sweet Chilli Sauce. Rasher bacon, crispy cos lettuce, creamy Caesar dressing, croutons and a sprinkling of parmesan. Spanish onion, crumbled feta, artichoke hearts, baby capers, Kalamata olives, mixed lettuce, Italian dressing and plump cherry tomatoes. Fresh mushrooms, red onion, roasted capsicum, Italian dressing, mixed lettuce leaves and cherry tomatoes. Six crunchy-on-the-outside, mushy-on-the-inside arancini balls, served on a bed of baby spinach and finished with Parmesan and herbs. Garlic, parmesan and herb crusted dipping fingers with a duo of dips of your choice. Delish sweet potato thrown together with bacon, thickened cream, mozzarella and garlic and topped parmesan cheese. Made fresh in store! Serves 2. Bite sized crumbed Karaage Chicken topped with Sweet Soy Sauce, Kewpie Japanese Mayo, shallots and a lemon wedge. Moreish bite sized crumbed Prawns served with a sauce of your choice: Aioli, Pesto Aioli, Sriracha Aioli, Hollandaise, Red Bean Salsa, Sour Cream & Chives. Golden baked dessert calzone filled with gooey chocolate, toffee and fresh bananas. A decadent Belgian chocolate ice cream folded with a red velvet ribbon, fudge and chocolate cupcake bites. A delicious salted caramel swirl folded through creamy malted ice cream with crunchy chocolate malt chunks. Sweet granny smith apple slices smothered with hot custard and mouth-watering crunchy crumble all served on our famous pizza base with a drizzle of salted caramel sauce. Smooth Irish Cream ice cream with a cappuccino swirl. A moreish chocolate ice cream with fudge pieces, marshmallows, biscuit pieces and a fluffy marshmallow swirl.